Heat oven to 350°F. In small bowl, beat cream cheese, brown sugar and pumpkin pie spice with electric mixer on medium speed until creamy. Set aside. On work surface, unroll dough into 2 large rectangles; firmly press perforations to seal. 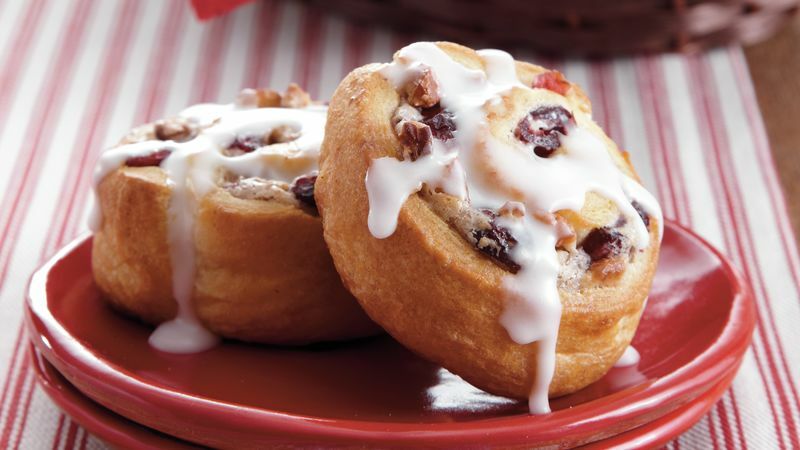 Spread cream cheese mixture evenly over dough; sprinkle with pecans and cranberries. Starting at 1 short side, roll up each rectangle. Cut each into 4 slices. Place slices, cut sides down, on ungreased cookie sheet. Bake 17 minutes or until golden brown. In small bowl, mix powdered sugar and milk until smooth; drizzle over warm pinwheels. Other nuts, such as almonds or hazelnuts, would taste good in these pastries, too.